← Join Hump Day $50 Giveaway! Delicious Spam Musubi from Mister Musubi! 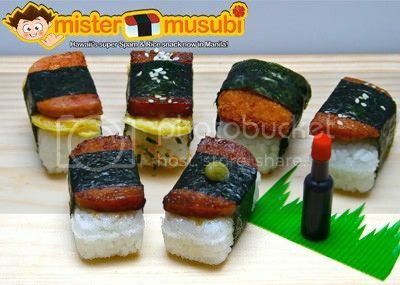 If you love Spam and rice like I do, then you will surely enjoy Spam Musubi from Mister Musubi! Spam Musubi is the most popular way Spam is prepared in Hawaii. Let me give you just a little bit of history on Spam. Spam started in the U.S. in 1937, but it became popular in Hawaii during World War 2. Spam was used to feed the troops when food was scarce. Spam stayed popular in the islands even after the war was over. Statististics show that in 2009, Hawaiians ate more than 6 million cans of Spam a year. That’s how much they love Spam! Spam Musubi is just like sushi, but it’s different because it uses spam and other tasty treats. Spam Musubi is Japanese rice shaped into a block, topped with marinated Spam slices and wrapped in roasted seaweed (nori). 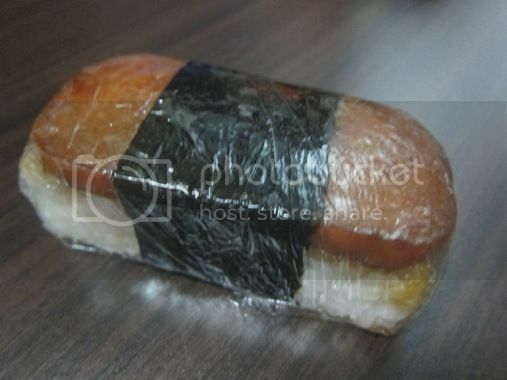 An angel knocked on my door yesterday to personally deliver free Spam musubis from Mister Musubi. That angel happens to be my classmate in college (Pinky Calica, now Pinky Calica-Vierra) who, together with his Hawaiian husband (Patrick Vierra), owns Mister Musubi. I was having a hard time taking good shots of the Spam musubis that Pinky gave us because my 5-year-old son just couldn’t wait. He simply couldn’t keep his hands off the Spam musubis on our dining table. I wanted to taste a little bit of everything, so we started with MusuBites. I liked that the Spam slices are neither oily nor dry; they’re actually juicy, and that made them more exciting to eat. Everything was yummy! Justin loves the spam and rice, but he’s leaving all the nori to me. LOL! After tasting everything, I already knew what I liked the most, their Spam Teriyaki! I super loved this! The spam slice used here was marinated in Teriyaki sauce. Apparently, this is their bestseller and rightfully so. It’s lightly sweet and tasty! I just couldn’t get enough of this! If you want your Spam Musubi bigger, then this one’s for you. You get two slices of spam, instead of one. I was actually saving this for Justin’s Dad, but the little boy wanted to eat more Spam musubis and he wouldn’t stop until he ate this, so I had no choice but to give it to him. I only had two bites of this Big Kahuna, and Justin ate the rest! He said we have to go to Tita Pinky’s house to get more! LOL! Verdict: The Spam musubis are delicious and filling, and they’re priced just right. Pinky Calica and Patrick Vierra lived in Singapore for a few years. Patrick’s Spam Musubi was a great hit with their friends there, so the couple thought it would be a great idea to share their Spam Musubi to a wider audience. That’s how Mister Musubi was conceived. 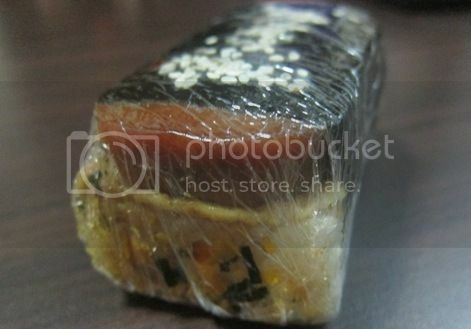 Mister Musubi started business in the Philippines only last year. 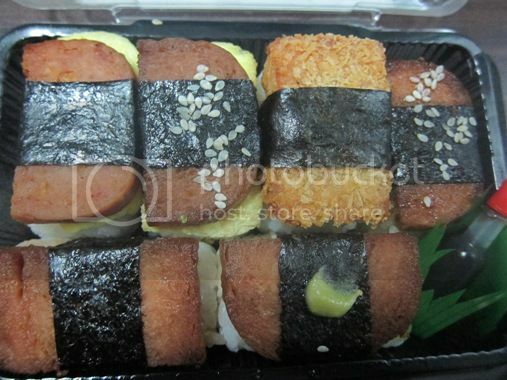 Aside from Spam, Mister Musubi also makes hotdog, hamburger, Korean beef and even logganisa musubis! Their musubis are perfect for road trips, pot-luck parties, outings, baptisms, weddings, showers, fairs, children’s parties and other events! *Call or SMS 0927-685-2765 with your order at least 1 hour before desired pick up time. *Let them know your pick-up time. *For party packs, they request 48 hours notice. *They accept cash only or payment through GCASH. *Currently, they are available for pick up only. *Pick up hours are from 7AM-8PM at 76 East Capitol Drive Barrio Kapitolyo, Pasig. They currently have a Mister Musubi Promo on ebay that you can check out here. This entry was posted in Food Friday, Food Trip Friday, Mister Musubi, Spam, Spam Musubi. Bookmark the permalink. 27 Responses to Delicious Spam Musubi from Mister Musubi! I love spam! I must must must try this! Very interesting. I also love Spam with rice and a sunny side up, and these look wonderful. And clever! They would also look nice and clean-looking for school “baon.” Hehe. I wanna try these sometime! I eat Spam every now and then. Actually, I keep a can or two always in the cupboard for emergencies. Btw, they have a a resto here in Glorietta that offers only Spam-based menu. I wonder if they’re still around. Really awesome how they serve up Spam in new and exciting ways, this is great! wow! I’ve never had this kind of dish before…very interesting…it looks yummy! Thanks for the feature, Tetcha! This is a competitor of the spam in glorietta because they sell the same spam but with a different tips. First of all, I would like to thank whoever invented spam. You are a genius. If I were stranded in an island and can only eat one food while I am there, that would be spam. I don’t care if I get sooo fat. Who knows if I can still leave that island. Lol. i love sushi, the food is art (sometimes i just feel like staring at it) and it’s enjoyable to eat. too bad i am from malolos. i am curious how different is it. That is just yummy I love japanese food ang looking at it makes my mouth water! Visiting late from FTF:) have a great week! spam is one of my fave lunch meat here in America 🙂 Visiting late from Food Trip Friday, hope that you can return the visit too.